Our cordless anti-static chair mats combine the beauty of a clear vinyl chairmat with anti-static protection. They are chemically formulated to dissipate static electricity BEFORE it has a chance to damage sensitive computer equipment. The protection is more than surface protection ... it's built in!! Available in studded SuperMat (.145- approx 1/8 in.) thickness only. For use on low pile carpet with no padding. Available In Rectangle and Single Lip Patterns. Anti-Static Mats will not dissipate static through rubber sole shoes. Unique "notched" stud design grips carpet, but won't harm carpet backing - or hands! Static electricity robs you of productivity and threatens the life of your expensive computer equipment. Motherboard, hard disk and card failures are often attributed to static electricity. Most computer manufacturers recommend the use of an anti-static device to guard against these failures. 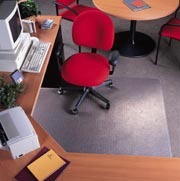 Static Dissipative Chair mats protect your data and equipment from this silent killer. That irritating shock you get when you touch a doorknob is caused by static electricity. Any time two materials in contact are separated, such as your feet and carpeting when you walk, a static charge is generated. One material loses electrons resulting in a positive charge, while the other gains them, becoming negatively charged. The shock you feel is the static charge neutralizing itself by instantly conducting the ground. This charge can be 2,000 to 20,000 volts, harmless to humans due to the small amperage of the charge. Electrical equipment, unfortunately, is much more sensitive. As little as 20 volts can cause loss of data, monitor malfunctions and premature component failures. Sensitive microchips and integrated circuits in computers can be harmed before you even touch the keyboard! In winter months, heating systems increase the risk by lowering humidity and increasing static charge. Keyboard and mouse pads that dissipate static depend on you to touch them. Anti-static chairmats provide instant passive protection - as soon as you approach your desk, static is dissipated (as long as rubber sole shoes are not worn)- before you know it and without your help! Our anti-static chair mats are chemically formulated to dissipate static electricity, so there are no cords to attach to the wall (to trip over, to break, etc.) Static electricity is dissipated from the entire surface of the mat into the air or ground in less than half of a second! Clear Anti-Static Chair mats are guaranteed to meet the requirements of National Fire Prevention Association Code 56A and Federal Specification MIL-B81705B for a period of at least three years from date of purchase. This requires dissipation of 5,000 volts within 1/2 second. Please Note: For use on low pile carpet with no padding.